If we’re to believe movies like ‘Goodfellas’, mobsters are particularly fond of their food. It’s a trope that German restaurateurs Oskar Melzer and his childhood friends James and David Ardinest have no trouble appropriating. Their latest venture in Berlin’s gentrified Kreuzberg quarter is the third diner named after a member of the Nosher Kostra, an unintentionally delicious moniker for the Jewish organised crime cartel in the 1940s. 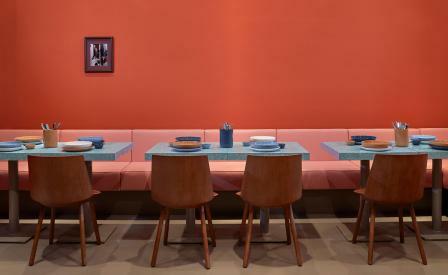 Melzer pulled double duty to team up with e15’s founder and architect Philipp Mainzer to create an almost Zen-like interior of orange walls, stainless steel bar, pink padded seats and customized walnut chairs. Unlike Frankfurt’s Stanley Diamond and Maxie Eisen, however, Louis Pretty’s culinary MO is Jewish-American fare – not kosher, the kitchen is quick to point out, but still referencing traditional recipes. Head chef Joey Pasarella’s marquee dish is a brisket that’s cured for a month, smoked, cooked and marinated to create a fork-tender pastrami that’s served simply on rye with slaw and pickled gherkin.